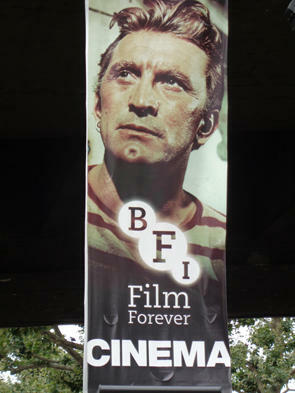 During my just-concluded trip to London, I was not surprised to find that Kirk Douglas was the cover-boy on the BFI Southbank’s September/October film screening program. He certainly deserves to be feted, and not just because he will be celebrating his 100th birthday on December 9. For Kirk Douglas is one of his generation’s premier movie stars. Those who know this Amsterdam, New York native only as the father of Michael Douglas render him a disservice. Along with Robert Mitchum, Gregory Peck, and his pal Burt Lancaster, Kirk Douglas is at the top of the crop of actors who enjoyed cinema stardom in the immediate post-World War II years. Unlike dozens of long-obscure faces who faded from the limelight, he was able to maintain that stardom for decades. And long before it became the norm, he was producing his own films and controlling their content. Even though I’ve never met the man, I feel as if I’ve known Kirk Douglas all my life because I grew up on his movies. One of the cinematic highlights of my childhood was Douglas’ dynamic performance as the slave leader in SPARTACUS, which dates from 1960. As Spartacus instigates a rebellion against the hypocrisies of Republican Rome, there is a lesson to be learned that is relevant to any age. You need not go through life passively. No matter what your circumstances, your spirit need not be crushed. You can be independent. But there is another side to the SPARTACUS story. During the 1950s, in the wake of the House UnAmerican Activities Committee hearings, scores of Hollywood professionals found themselves blacklisted. One of the ironies of the era was that blacklisted screenwriters could maintain their careers using pseudonyms but had to toil for cut-rate fees. Dalton Trumbo, author of the SPARTACUS script, was one such writer. In fact, the story for the 1956 feature THE BRAVE ONE earned an Academy Award for “Robert Rich,” who was Trumbo in disguise. At Douglas’ insistence, Trumbo was given complete credit for his work on SPARTACUS. He was the first of the blacklisted writers to be publicly acknowledged with a screenplay credit. This act of fairness reveals as much about Douglas’ feistiness, and determination to back his feelings and views with action, as any role he has ever undertaken. Most of Kirk Douglas’ best screen work came early in his career. If, for example, you wish to savor an actor giving an eye-popping notice-me-style star-making performance, check him out in CHAMPION, which dates from 1949. Douglas is exceptional as Midge Kelly, a boxer with a bad attitude. This is the performance that not only assured his stardom but earned him the first of his three Academy Award nominations. His two others were for his charming but merciless Hollywood mogul in THE BAD AND THE BEAUTIFUL and his troubled, tempestuous Vincent Van Gogh in LUST FOR LIFE. A personal favorite of mine is ACE IN THE HOLE, also known as THE BIG CARNIVAL, in which Douglas plays a manipulative New York newspaperman who’s been sentenced to media oblivion in Albuquerque, New Mexico. Another is PATHS OF GLORY, and the actor does not exaggerate when he calls it “a truly great film with a truly great theme: the insanity and brutality of war.” One would be hard-pressed to find a better American film that skewers both the military mentality and the kind of class differences and abuse of power that, sadly, have shaped our world for centuries. Dalton Trumbo also scripted LONELY ARE THE BRAVE, a thoughtful drama with Douglas playing a rebellious modern-day cowboy. He has described this as the favorite of all his films, observing: “I love the theme that if you try to be an individual, society will crush you.” Kirk Douglas has tried to be an individual-- and he has not been crushed. Rather, he has triumphed. Given its title and storyline, LES COWBOYS-- a new film that has been released theatrically here in the U.S.-- has to be categorized as a Western. This is so even though LES COWBOYS was made in France, is set in non-American locales, and unfolds not in the 19th century American West but in more contemporary times. In THE THIN BLUE LINE, a landmark documentary from 1988, filmmaker Errol Morris conclusively proves that a man named Randall Adams was wrongly convicted of murder and dispatched to prison. Adams is victimized by a corrupt justice system in Dallas County, Texas, and, as a direct result of Morris’s investigative skills, he wins his freedom. Such is the power of filmmaking at its very best. When one thinks of Humphrey Bogart, one thinks of "The Maltese Falcon", "The African Queen", "The Treasure of The Sierra Madre", and, of course, "Casablanca". However, one worthy film starring Bogie has finally become available on home entertainment. It is titled "Deadline - U.S.A" , it dates from 1952 and, while admittedly not of the caliber of a "The Maltese Falcon" or "Casablanca", it is a fine film that for one reason or another is too little-known. At this time of the year, escapism rules in movie theaters. And this is understandable. It’s the summer, and people are searching for summer fun. Now granted, some seasonal theatrical releases are satisfying, but it’s been my experience that the majority are not. Yet the point here is that films that tackle serious issues are occasionally arriving onscreen. One of them, a documentary titled INDIAN POINT, not only is information-packed and provocative, but it is a film with a local connection. In an age when we have come to believe that any film can be seen leisurely at home if you sit on your sofa long enough, it is particularly exciting to enjoy a cinematheque screening of a film that is not available to the home market in any format, one that has not been shown on home or theater screens for close to 100 years.